Welcome to Day 4 of TLC and gut balance for your belly! Sign up for the email if you want to receive a happy-gut tip every day for the next three weeks. Immediately improve your gut health, and make it easy to love your belly, so that your belly loves you! Today, we are continuing to build our home-medicine kit of homeopathy for the gut. Here are four more excellent remedies for the Save-Your-Belly Homeopathic Kit. 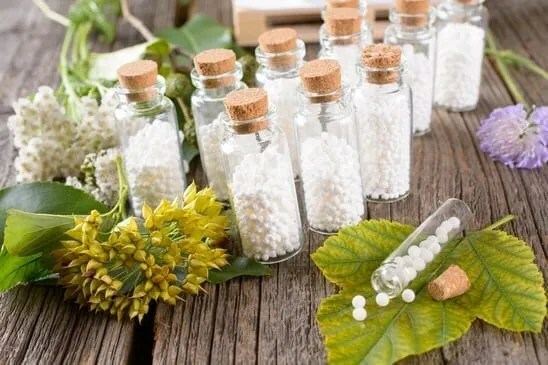 Special thanks to Kathleen Boisen, OMD, who has advised me so skillfully over the years, and taught me how powerful a subtle medicine like homeopathy can be..
Homeopathic prescriptions are sold in containers the size of a lipstick tube, so you can easily keep three or four in your bag. Don’t be intimidated by the details in the list below–it is for your education and awareness. The labels on your remedies carry excellent descriptions of what they treat. For burning, bloated feeling in the gut; ill effects from over-indulgence of rich food late at night with salty taste in mouth; feels better after belching; skin is damp and cold; sweaty diarrhea..
Belladonna battles sharp stomach pains which suddenly strike and then disappear suddenly. The pain is worse with motion and better with steady pressure and when lying on the stomach. This is good for fever and flu..
Nux vomica is excellent for indigestion after eating, bitter nausea, sour stomach, vomiting, or diarrhea. It works well when you have eaten and/or drunk too much. It is excellent for hangovers. Take three tablets under the tongue every fifteen minutes in crisis; and then every two hours. .
Probiotics are live beneficial bacteria that live in our gut, and are absolutely essential to our vitality and wellness. Healthy bodies make their own, and also, we get them from fermented foods. Most of us do not make enough of them!! And, a course of antibiotics or sustained stress can wipe them out. And when they’re diminished, we are susceptible to Candida, which is a yeast overgrowth. This causes gas, bloating, skin rashes, vaginal itching, allergies and even depression. Prebiotic fiber is the non-digestible part of foods that go through the colon undigested and then ferments. This fermentation feed gut bacteria colonies and increase desirable bacteria in our digestive system. It is also essential for gut and bowel health! I created FIBER ENERGY specifically for it’s gentle support of our gut and it’s prebiotic properties.FIBER ENERGY supports glucose and cholesterol metabolis and features Shimizu Propol, a highly pure, natural soluble fiber. It mixes easily into foods or smoothies! For daily inoculation of life-giving probiotics, I created PROBIO ENERGY, a refrigerator-free probiotic. Notably, this PROBIO Energy provides 30 million CFU per capsule of four strains of beneficial bacteria. These include lactobacillus acidophilus and the (well studied) HN019 strain of Bificobacterium Lactis. Like all my products, it is non-allergic, diary-free, gluten-free and sugar-free. Because refrigeration is not required, it is ideal travel support. Protecting the gut from unwelcome parasites when traveling is key to immunity as well as fun, healthy vacations! Happy-Gut Reminder: Try a homeopathic remedy the next time you have gas, bloating, nausea or the flu.